DARUMA MUSEUM (02) ... DARUMA ARCHIVES: Jimotsu - What is Daruma holding? Jimotsu - What is Daruma holding? "Why is this Lady Daruma holding a duster? Is she going to clean her home?" Well, that was the origin of this story. Here are some answers. To identify a Buddhastatue one clue is the item that the deity is holding in its hands. In Japanese this is called "jimotsu" 持物. Since many renderings of Daruma feature a tumbler doll with no arms or legs, he is not carrying anything, but this absence of arms and legs itself helps to identify a Daruma. 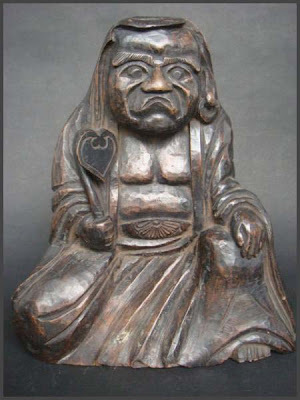 Daruma as represented in his form as Zen master, Daruma Daishi, is seated or standing, hands folded below the robe, hands in meditation pose or holding something with one or two hands. The statues of a Kannon Bosatsu with 1000 arms are maybe the most representative to study the things a Buddha can carry. Here are two illustrations of the things carried in the left and right hands (remember, there should be 500 each!) but here we have just a small sample. 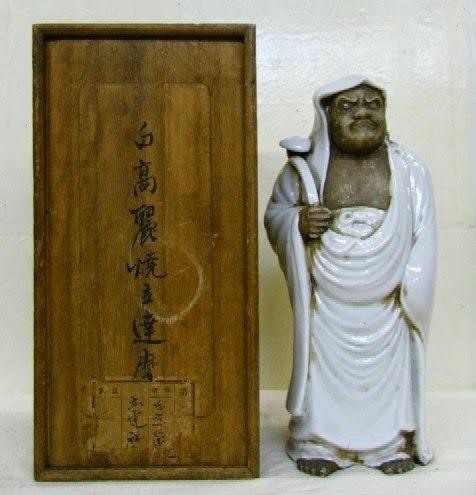 This is a typical statue of esoteric Buddhism. Each item represents one of the vows of the Bosatsu to help and save all of mankind. On the palm of each hand an open eye is usually painted or engraved too, so this Bosatsu can see all the misery in the wolrd and rush to help. In an abbreviated form most statues have only 42 arms holding different things, since it is said that one hand can fulfill 25 vows. This is a whisk used to flick mosquitoes away. This tool had its practical use in India and other hot countries. Usually the whisk was made of the hair of Tibetan yak and used by highranking priests. It came to be symbolized especially in Zen Buddhism, where it stands for the swishing away of delusive thoughts and ideas which are continuously troubling the normal human being. Since Daruma is a high-ranking priest, of course he carried such a flywhisk to flick away the moskitoes around him and the "spiritual moskitoes" in the minds of his disciples. This is maybe most often found as an attribute of Daruma san. Even some tiny MINI ones where depicted with it. And he does not even need hands to hold it, it can just be painted on the body. Daruma can hold the hossu in his right or left hand, have it hanging down or hold it straight upright or even recline and let it dangle over his shoulder. as in the use of the "Wishfulfilling Jewel"(nyoi hooju 如意宝珠), another attribute of the Kannon with 1000 Arms and very often a Jizoo Bosatsu. (Sometimes this jewel is painted on the belly of a Princess Daruma.) Nyoi is a kind of broad ladle with the top part formed like an auspicious bat (koomori 蝙蝠) and is used by priests during the recital of sutras or lectures to emphasize a point. It is about 30 cm long. In ancient China the top part was sometimes made out of a mushroom with an auspicious shape to symbolize long life. You can see it with statues of high priests of the Zen sect and esoteric Buddhist sects. When Daruma Daishi is depicted as a normal priest, this is his iconographical symbol.
. Koraiyaki 白高麗焼 - White Korean Pottery . Rosaries were introduced to Japan with Buddhism. Originally rare and precious, the spread of Buddhism brought wider use of "Nenju" from the Heian Period (8th-12th century) to the Kamakura Period (12th-14th century). Permission to trade in rosaries during the Edo Period (17th-19th century) made them available to the general public. Kyoto has many head temples of various Buddhist sects, and the techniques of making Rosaries have been passed down from generation to generation. Usually they have 108 beads. There are old rosaries, which Kooboo Daishi brought back from China to Japan. They are of the long type with 108 beads. We found the rosary in the story about KATSU! and Yakimono (1). Daruma is holding a rosary and also a scroll with a sutra. This is a very special statue in my museum, with an individual facial expression. And there is at least one more like this in Japan. We met Daruma carrying one shoe in the story about Sekiri. In the story about Yakko Daruma, he was carrying a helbard, but that is the iconographic item of a Yakko, not Daruma himself. Finally here is Daruma carrying a small Monkey, at least that is what the animal looks to me. If you know about similar features, please share them with us. 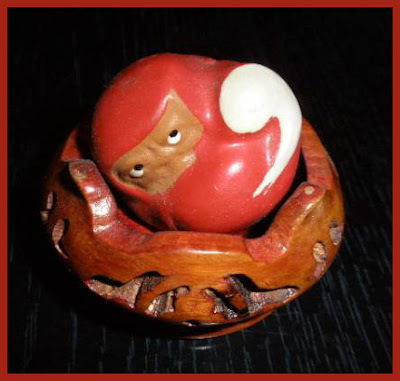 This is a wooden Chinese Daruma statue with a tiny animal, probably a monkey.